Specially formulated for the removal oils, minerals and debris from your spa and hot tub filter. Supplied in a handy trigger spray its Non-Soak enables the filter to be cleaned quicker resulting in less down time of your spa and hot tub. D.E. and Cartridge Filters: Best results will be obtained when the soiled elements are hosed before cleaning to remove as much debris as possible. Also hose well before re-assembly. Never add this product to pool water. 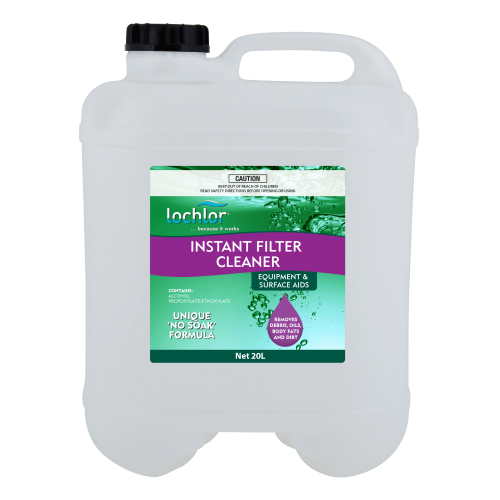 Lo-Chlor recommends that filters be cleaned regularly. Make filter cleaning part of your regular winter shutdown maintenance program.